Reflections Around the Campfire: I Love New York State Parks - and CampADK! Rather than just provide a complete list of my favorite blogs and websites under “Check out my favorite places,” I’m adding them one at a time and letting you know exactly why I like them. That way, you’ll be able to determine whether or not the site might be of interest to you. Besides, these sites do such an awesome job of providing information and/or entertainment that I believe they deserve to be in the limelight! Today, let’s take a look at CampADK.com. When you mention New York to many people outside of the state, the first thing that comes to mind is New York City. What’s fair is fair – the 8.5 million people who live in New York City represent about 43% of the 19.75 million people who call the state home. But, if you look past the population to the natural resources of the state, the areas outside of New York City simply shine. New York has approximately 100 State Parks, each with its own personality and characteristics – just like our National Parks. Camping opportunities are abundant whether you enjoy sleeping under a canopy of deep green pines, waking up to the soothing sound of a running river, enjoying your morning coffee with the benefit of a gorgeous lakefront view or watching the setting sun from your campfire as it sinks over the plains at the end of the day. Dave and Kate at CampADK.com have made choosing a campsite at a New York State Park extremely easy for you, whether you live down the road or across the country. That’s because Dave has made it a mission to photograph the campsites in New York’s delightful State Parks and post them for you at CampADK.com (link HERE). Not only are there photos of almost every site, but there are multiple photos of many of them – views from the road, views from the side, views back toward the road, views of the lake or river if it’s a waterfront site. You can sort for campsites by length on CampADK.com, and can easily see which sites are waterfront and which are not. I can’t even imagine how much time Dave has put into this incredible database of more than 42,000 photos, but I can tell you that I have benefited from his dedicated efforts on many occasions – including earlier this week. (Thanks, Dave!!!) So, if you’re a fellow camping enthusiast, when you hear the words “New York,” think Parks not City! Get out and explore the true heart of the state – the wild and beautiful places outside of New York City – the Adirondack and Catskill Mountains, the Finger Lakes, the 1,000 Islands and the Niagara frontier. 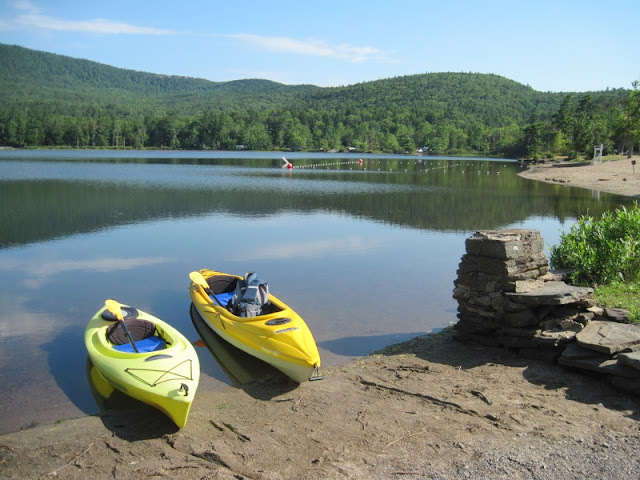 Don’t forget your hiking boots, bikes, fishing poles, kayaks and canoes. This state is an outdoors lover’s paradise and, thanks to CampADK.com, you can see just how spectacular it is before you even leave home!